President Trump's new national security strategy explicitly specifies "jihadist terrorists" as one of the two "primary transnational threats Americans face." 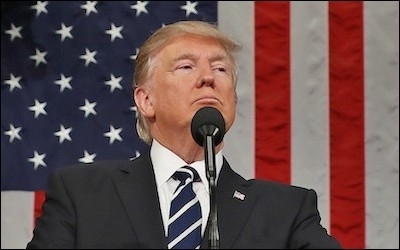 President Trump's new national security strategy is set to return words relevant to understanding Islamic terrorism—such as "jihad"—that had been expunged from the Intelligence and Defense communities' lexicon, most notably under the Obama administration. According to the new strategy document, "The primary transnational threats Americans face are from jihadist terrorists and transnational criminal organizations"; the document also vows to "pursue threats to their source, so that jihadist terrorists are stopped before they ever reach our borders." This is significant on several levels—the first being as basic as "knowing one's enemy," which President Obama had refused to do. In 2011 it was reported that "the Obama administration was pulling back all training materials used for the law enforcement and national security communities, in order to eliminate all references to Islam that some Muslim groups have claimed are offensive." One Obama official explained the logic: "I want to be perfectly clear about this: training materials that portray Islam as a religion of violence or with a tendency towards violence are wrong, they are offensive, and they are contrary to everything that this president, this attorney general and Department of Justice stands for. They will not be tolerated." It should be noted, however, that the politically correct induced paralysis that Obama championed was already well entrenched before him. Speaking in 2006 during the George W. Bush administration, William Gawthrop, a former Pentagon official, said "the senior Service colleges of the Department of Defense had not incorporated into their curriculum a systematic study of Muhammad as a military or political leader. As a consequence, we still do not have an in-depth understanding of the war-fighting doctrine laid down by Muhammad, how it might be applied today by an increasing number of Islamic groups, or how it might be countered." 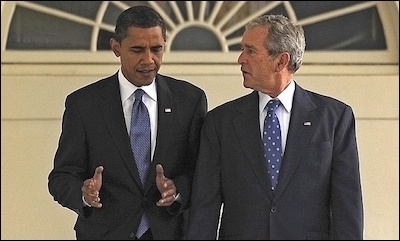 Presidents Barack Obama and George W. Bush scrubbed references to the religious orientation of jihadist terror attacks from official U.S. statements. Similarly, a 2008 government memo that also appeared under Bush warned against "offending," "insulting," or being "confrontational" to Muslims: "Never use the terms 'jihadist' or 'mujahideen' in conversation to describe the terrorists. A mujahed, a holy warrior, is a positive characterization in the context of a just war. In Arabic, jihad means 'striving in the path of God' and is used in many contexts beyond warfare. Calling our enemies jihadis and their movement a global jihad unintentionally legitimizes their actions." Needless to say, such instructions were and are wrong on so many levels. Jihad is the antithesis of Just War; the former by nature is aggressive the latter defensive. The claim that jihad literally means "striving ... and is used in many contexts beyond warfare" is as disingenuous as claiming that the words "boyfriend" and "girlfriend" literally denote a friend of one gender or the other, and nothing more. In both cases reality is more complex: just as a "boyfriend/girlfriend" implies a very specific kind of friend to Western ears, so too does "jihad" imply a very specific kind of struggle to Muslims ears—armed warfare against the infidel to make Islam supreme. Finally, the claim that "calling our enemies jihadis ... legitimizes their actions" is beyond silly: Muslims are hardly waiting for Americans—"infidels"—to confer or withhold Islamic legitimacy on anything. They have their own Islamic scriptures, law, and clerics for that. Stripped of all words dealing with Islam, analysts failed to understand jihadi motivations, tactics, strategies, and goals. Stripped of all words dealing with Islam, how were analysts to understand jihadi motivations, tactics, strategies, goals, and a myriad of other considerations? Far from taking the most basic advice regarding warfare—Sun Tzu's ancient dictum, "Know your enemy"— the U.S. government could not even acknowledge the enemy. Nor does much seem to have changed, at least in the Legislative branch. Five months ago, and by a vote of 208-217, the U.S. House of Representatives voted down an amendment that would require the Defense Department to conduct "strategic assessments of the use of violent or unorthodox Islamic religious doctrine to support extremist or terrorist messaging and justification." The rational given by those voting it down is familiar: Jamie Raskin (D-MD) said that "terrorist killers have used religious doctrines and concepts from every major religion on earth ... Focusing on (Islam) exacerbates the problem by fomenting the myth that religious fanaticism and terrorism are unique to the charlatans and predators of Islam." Pramila Jayapal (D-WA) denounced the amendment's inability to "apply its arbitrary surveillance equally" by "includ[ing] assessments of White supremacist terrorism or terrorism committed against abortion clinics and doctors." But as Clifford Smith observes: "While few people in the U.S. military are likely to come face to face with an angry and armed racist or anti-abortion activist in the line of duty, radical Islamists make it their business to kill Americans in nearly every corner of the world.... [I]t is unsupportable to say that all religions are the same, or that all religions have equally threatening ideological trends at all points in history." Trump's return of terminology relevant to the question of Islamic terrorism is a step in the right direction. Be that as it may; that a majority of the House of Representatives voted down an otherwise commonsensical amendment is a reminder that the issue of ignoring jihadi ideology and seeing only generic terrorism continues to transcend the activities of Obama and permeates a significant portion of American society—including, no doubt, in the Intelligence community. Trump's return of terminology relevant to the question of Islamic terrorism is certainly a step in the right direction. Yet, just as Obama was one man who did not create but rather championed the politically correct approach to Islam, it still remains to be seen if Trumps one-man efforts will overcome decades of indoctrination.